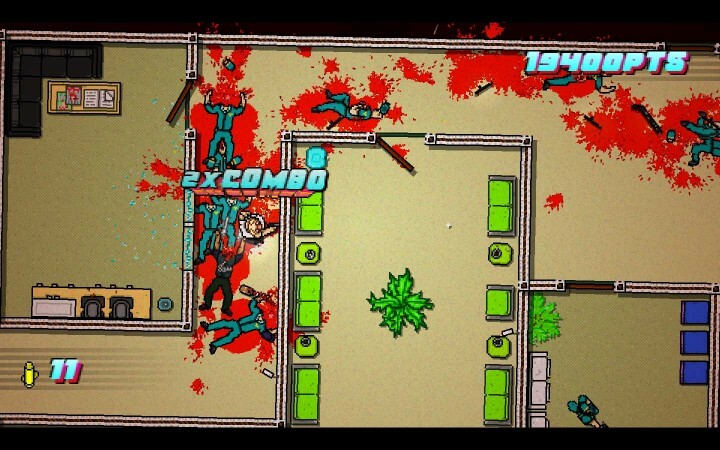 Hotline Miami 2: Wrong Number is an action-packed gorefest of a game that tries really hard to sell you its concept. 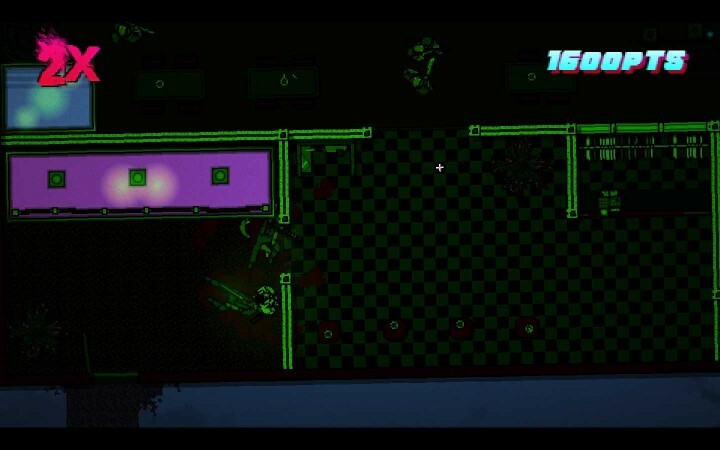 The ultraviolent gameplay is set to caricatures of 80’s culture, complete with neon colors and pulsing electronica beats just like the good old times. At its best, it’s a visceral joy to carve through swathes of enemies with a varied arsenal of weapons. But at its worst, it’s an exercise in testing your patience with random guessing game outcomes. While the gameplay was intense and fun, there’s an exponential rise in frustration in the later levels, ultimately souring the overall experience. With the environment viewed from a 2D top-down perspective, I was expecting the gameplay to be like Smash TV; instead it played more like an FPS. You must plan the best course of action to finish each stage with the maximum number of points by chaining kills to get multipliers. However, in lieu of action packed shootouts and massive gun fights racking up killscore in the hundreds, it is a stealth game of cat and mouse. Every line-of-sight will trigger an immediate chase to your death, and a loud gunshot will attract nearby enemies like swarming bees. The planning, the trial-and-error, and the subsequent optimization of movements and paths became the focus. The entertaining plot bounced from character to character, showing the different scenarios that plague the city. The graphics are gritty and heavily pixelated, dotted with gaudy 80’s fashion. The overall tone is dark, laced with crime and insanity, and the humor is equally black. Add on top a catchy techno soundtrack, and the atmosphere feels perfect. Fully immersed in the environment, the gameplay then took center stage. Sometimes you can get into a flow of nonstop kills, going on a beast-mode killing spree, which makes the stealth sections feel slow by comparison. A few frustrating issues pop up here too, with invisible enemies and lengthy execution animations causing cheap deaths. The challenge became more repetition and luck — but the game mechanics were still evolving at this point. As more characters were unlocked through story progression, more masks also became available which granted unique powers. Masks were exciting and added personality to the game. The tiger mask, for example, has a death punch. Normally when you punch, you will knock down an enemy for few seconds, letting you either execute them or wait until they get back up. With the tiger mask equipped, every punch will immediately kill the enemy. Another mask allows for dual-wielding where you can shoot in two different directions, another gives access to a roll/dodge maneuver, etc. It added personality to the game, and it was exciting finding new talents and skills to use in both new levels and previously beaten stages to get higher scores. I hadn’t noticed something earlier because the game was much easier, and I was having so much fun with the tiger mask bashing enemies’ faces in with the death punch. As the stages got harder and the enemies per floor increased to 20 or more, silent one-hit killshots became required, not optional. Any attempt to rush in and improvise will guarantee a quick death. When lock-on targeting becomes crucial and every bullet is the difference between passing or failing the stage, the fact that the bullets will shoot randomly gets really aggravating. Often, bullets will hit the enemy on the first try with a clear path to the target. Also as often, the bullets will just miss for no apparent reason. They’ll spread in a cone of random directions, forcing you to accept a death as the AI retaliates. 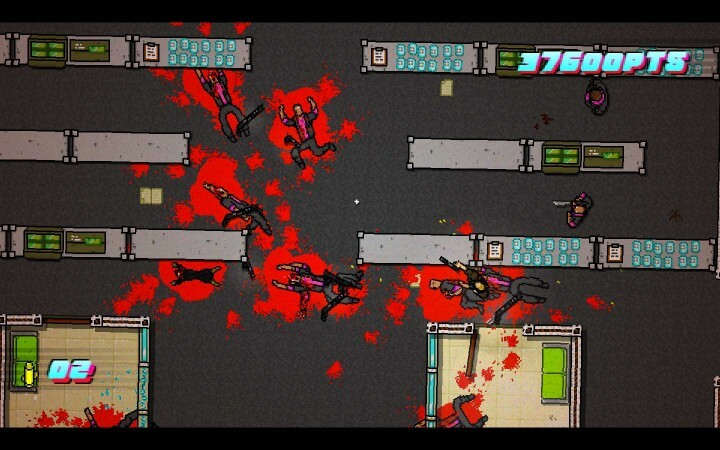 Even in the late game, Hotline Miami 2 still provided a breath of fresh air with each and every stage. I was constantly unlocking characters/moves/weapons, tougher enemy types, and environmental challenges — like windows that let enemies detect you from afar. Some situations left no chance to apply my skills, relying instead on luck and trial-and-error. It’s not fun. However, the trigger-happy AI and frustrating mechanics resulted in a rapid decline of the fun factor. Along with the randomness of gunshots, other pain points repeatedly surfaced such as the inability to tell which direction doors open and whether a knife will become embedded into the enemy’s head, rendering it useless and leaving you suddenly unarmed. These situations left no chance for me to anticipate and apply my skills, relying instead on luck and trial-and-error. It’s not fun. Stages like the club scene were especially heinous. It’s almost completely dark, with only a small ring of dim light around your character. Completing the stage was basically like playing blind, shooting in the general direction of where I thought enemies were located. This is made exponentially more annoying with the random mechanics mentioned above. You might compare this to other frustratingly difficult games like I Wanna Be the Guy, but that game is solely based on player execution and memorization. 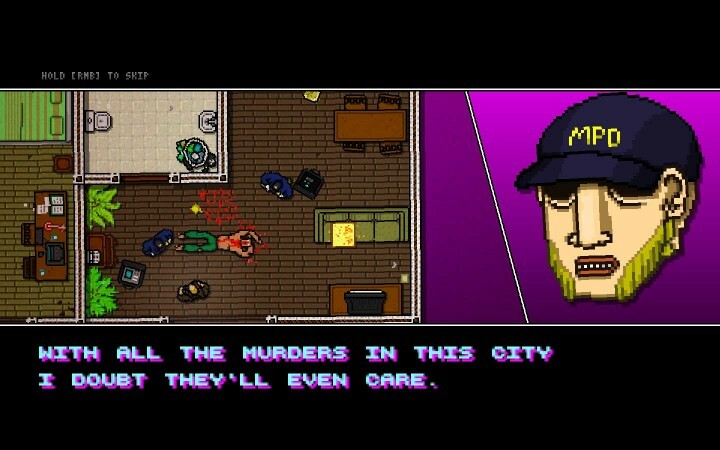 Hotline Miami 2 isn’t. I really don’t understand the fascination with game developers who believe randomness somehow makes the game more fun/fair/rewarding, or that it adds replay value. It’s completely the opposite and makes the experience unenjoyable. 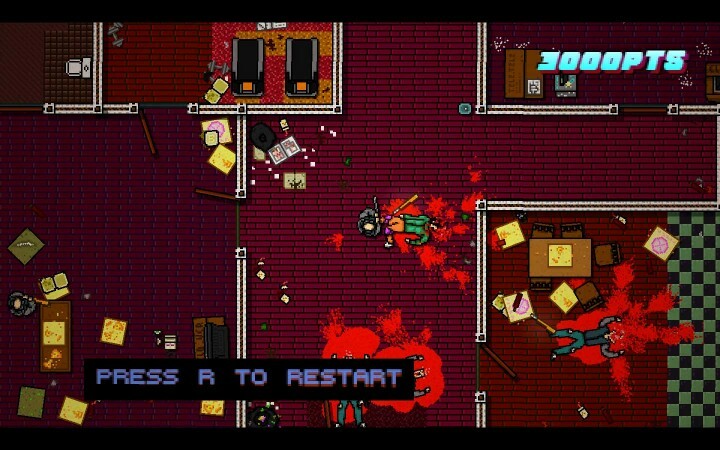 Hotline Miami 2: Wrong Number started off as an entertaining gorefest with a lot of moments of pure fun. Unfortunately it slowly devolved to become endless torture with the gameplay having little redeeming qualities. The storyline, music, and presentation all had great potential, and I would love to see the fun factor be the main focus in Dennaton Games’ next release.